Not bad. My thinking capacity to cooking I believe is getting up and about, and higher, but seemingly Thai cuisine is a favorite. Why not? Why shouldn't I anywhere? What should potentially stop me when I have already mastered quite a whole list of dishes and Laksa by far has already been cooking conquered as well (Shrimp Pad Thai, Thai Crispy Fish, Tom Yum Goong, Thai Carrot Soup & Thai Green Fish Curry). Laksa Lemak by the way is the marrying of Curry Laksa (Penang Curry Mee) and Assam Laksa (Nyonya Hot And Sour Fish Broth Noodle) regardless of the fact that there are various types of Laksa Lemak which can be made from chicken, pork, beef and seafood (Sarawak Laksa, Singapore Laksa, Nyonya Curry Laksa & Prawn Curry Laksa). 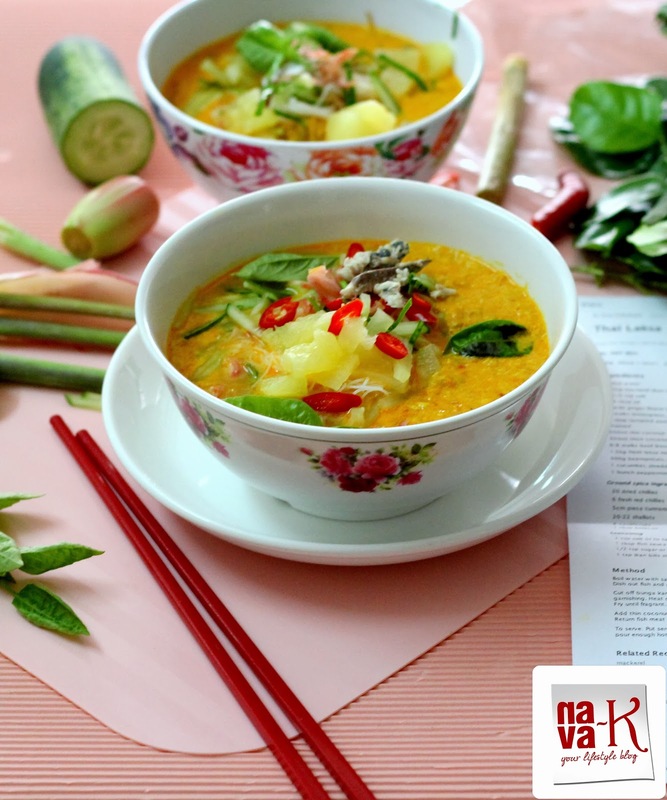 But for this Siamese Laksa Lemak, the two central ingredients are fish and coconut milk (Thai Fish Noodle Soup & Laksam Kelantan). Also, you need to make the laksa paste which showcases the crucial Thai herbs and ingredients (Spicy Thai Noodle) for this joyous, sensational and mouth popping Siamese Laksa Lemak. Simmer fish with 1 litre of water till soft and tender. Remove from heat; drain stock and keep aside. Once fish is cool down, remove bones and flake up. Add the fish flakes in the stock and keep aside. Heat oil and fry curry paste till aromatic and oil splits. Pour in fish stock, add dried tamarind and season with fish sauce and salt. Simmer over low heat till broth starts to boil. Simmer over low heat or warm up again before serving. Assemble noodles in bowl with basil leaves, lime leaves, pineapple, cucumber, ginger bud and chillies. Pour broth over and serve immediately. Laksa is something which has been on my bucket list of 'to cook' things. Your recipe looks wonderful and I think I will take try it on the weekend. Hai, Nava, just got time to visit your blog. Busy this few days, my son was sick with high fever, now flu and cough. Tired. Never try this kind of laksa, here was just limited choice. So colorful & tempting. Never knew there were so many variation in Laksa. Whenever I see your recipes, I keep looking at the pictures again and again!! Loved the colors and the pretty picture the laksa makes!! Looks good. Been really hard to find candle nut here. I will save this recipe and try it one day. Never personally had Thai laksa. Looking at the ingredients, I can imagine the aroma. 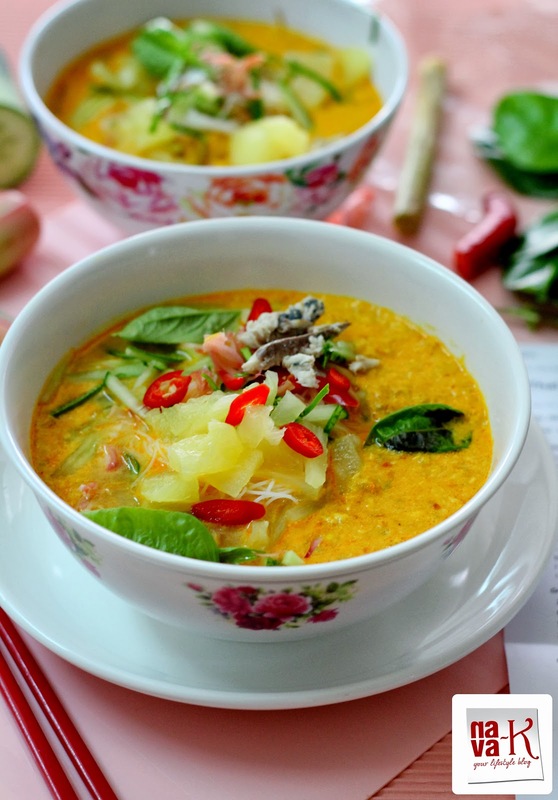 There is nothing as flavourful as a bowl of hot Laksa. We get it everywhere around Sydney but tastes vary from place to place. But overall the blend of spicy, creamy, tangy is always great. These bowls look mouth watering and so colourful. I have to give your recipe a try...if only I could make it as good as yours! Bold flavours and colours too! Wouldn't I love to dig into that? I have made laksa but without all the ingredients mentioned here...will make this the next time I'm in Delhi...easier to scout around for ingredients there. I loved this dish.Its looks so yumm and lovely presentation.The colours are just amazing and loved the ingredients. That is indeed a power packed meal with fish,carb green and flavor in one dish.Pics tell me the food is really delicious. Hey Do have a look at my latest post on my blog too .. Thank u ?? Looks very tempting, so creamy and full of flavors. 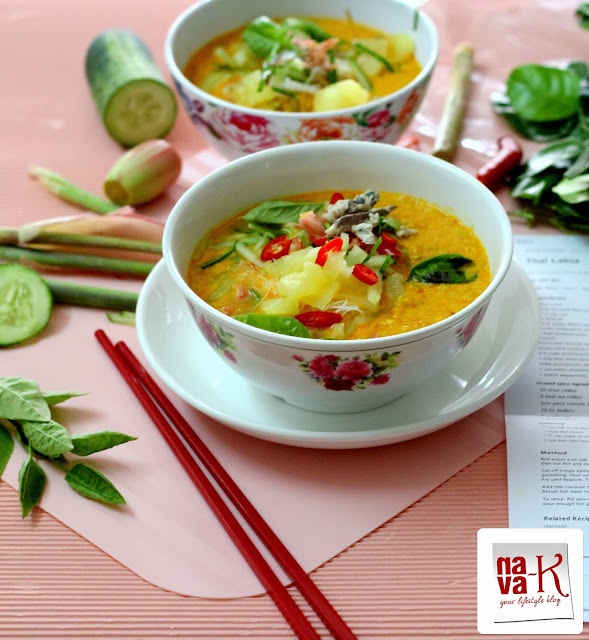 Hi Nava, looking at your Thai Laksa, I need 2 bowl, please! Look awesome! I love Thai food and this looks so flavorful and delicious. Going to try this soon! Like how the red chili add a pop of color delicious recipe doll.